Propaganda prints used to raise public support for World War One are going on display at the National Museum in Cardiff. The exhibition of 66 lithographic prints is part of national commemorations of the war's centenary. The prints were commissioned by the British government in 1917 to raise public morale as fighting continued. The exhibition includes work by celebrated artists including Augustus John and Frank Brangwyn. Designed in two sets of portfolios, called "Ideals" and "Efforts", the images were designed to encourage a war-wary public and muster support. They show modern political propaganda in its early stages. Allegory and symbolism is used in the "Ideals" prints to address the question of why the country was at war with Germany, while the "Efforts" collection illustrates some of the activities of the war effort. As propaganda, the images deliberately avoided showing the horrors and atrocities of war, typical of the work of the official war artists. Beth McIntyre, exhibition curator, said: "Although many of the government files relating to this print series were lost in a fire, I have been able to piece together a lot of information to establish how much the artists were paid and where the prints were exhibited. "As far as I know this is the first time that this series has been displayed in its entirety since 1920. "It is a wonderfully diverse group of works, which offers a great insight into artistic propaganda of the First World War." Culture Minister John Griffiths said the exhibition formed a key part of Cymru'n Cofio Wales Remembers 1914-1918 marking the centenary. He added: "The war is widely seen as one of the most deadly conflicts in human history, with millions of people, both military and civilian losing their lives." 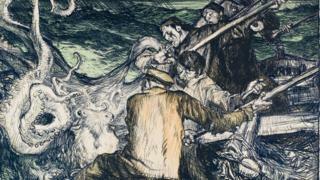 Efforts and Ideals: Prints of the First World War runs from 2 August 2014 to 4 January 2015.